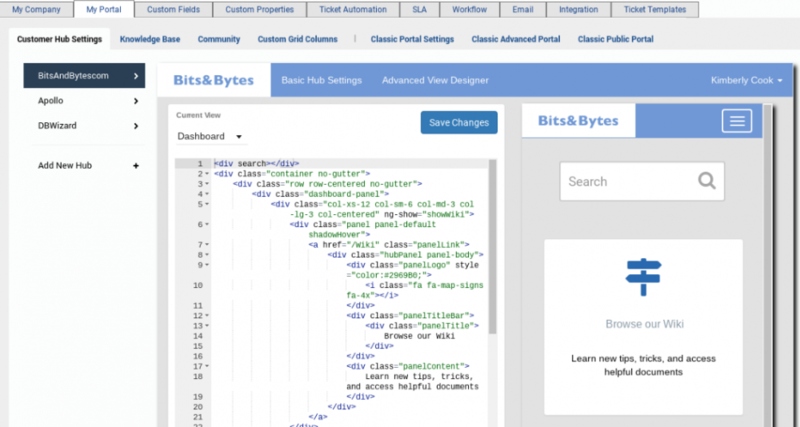 If there are edits that you would like to make to your Customer Hub that cannot be handled by the Basic Hub Settings tab, you may be able to edit the HTML directly using the Advanced View Designer tab. We recommend building your Hub on in a Sandbox environment so that you can test offline. *If you make changes to your HTML code, we can no longer push updates like new features to your page. This is to prevent accidentally breaking the code that you have customized. You may find the up to date factory code pages as sub pages underneath this article. Here is an example. We will also post the code changes to our Customer Hub version history. You can browse this version history by going to Help->Support Portal->My Products->Customer Hub. You may choose to add the code snippets into your customized code to take advantage of new features. Page: The upper left hand corner of this page has a drop down menu which allows you to switch between pages in your Customer Hub. We have included all of the default HTML for all of the available pages. Here is an example. Code Pane: Depending on the page you have selected, the HTML code will display underneath the page selection on the left hand pane. You can edit the HTML code in these pages as necessary. Review Pane: Depending on the page you have selected, a review of the page will display on the right hand pane. If you update the code on the left hand pane, the review pane will update accordingly after changes are saved. Save Changes Button: If you choose to update HTML code, you must hit this button. Changes take place immediately. Revert Button: If you have made changes to your HTML code, a red revert button will be displayed. Clicking this button will allow you to revert back to factory settings. This change can not be reversed, so please be sure you intend to revert back to factory settings by clicking OK through the confirmation window.